My favorite ingredient when Christmas baking is orange zest. I love its smell. Even if I just eat an orange I like to leave the peel lying around for an hour or two and the whole room will become fragrant with orange. The zest gives such a lovely tangy flavor to bakery goods. 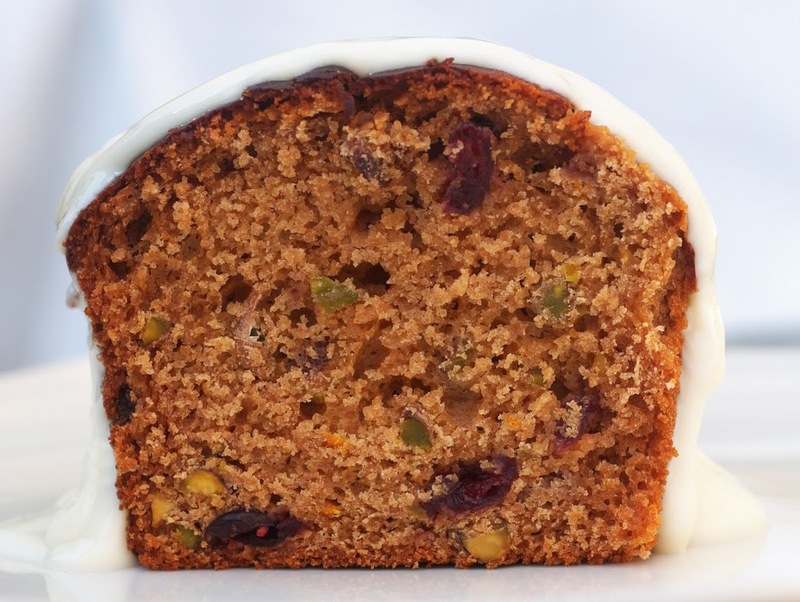 Combined with cranberries and some nuts it gives the ultimate Christmas flavor. This healthy Christmas breakfast cake contains all that: I used pistachios as I like the green color in contrast to the red cranberries. The cake can easily stay without icing, but I love the thick white layer on the cake that looks like fresh snow. It is a truly no-guilt cake, as it uses buttermilk, canola oil and whole wheat flour. We love it as breakfast cake and I indulge another thick slice with my afternoon tea. In fact, I am just having the last slice as I am writing this…. Preheat oven to 180C. Grease a loaf pan or line it with parchment paper. Combine all wet ingredients and mix well. Whisk together flour, baking powder, salt and cinnamon. Stir in the the wet ingredients and mix until just combined. Don’t over mix. Fold in orange zest, cranberries and pistachios. Transfer the batter to the loaf pan and bake for 50 minutes or until bread tests done. Let cool on a wire rack. Combine cream cheese and agave syrup. Once cake has cooled, put a thick layer of cream cheese on top of the cake. Let become solid before serving.